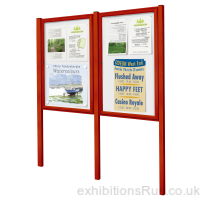 Ranges of external lockable notice boards and street bulletin boards for wall and post mounting, suitable for all outdoor applications. 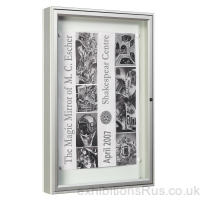 All notice boards have a magnetic backboard surface in white powder coated paint finish. All our units are lockable and come with our special plexi choc high impact glazing or safety glass on special request. There are also illuminated versions of some of the external notice boards and show cases, ideal as menu boards outside of restaurants, cafe or bar. All of these notice boards are made in Europe to the very highest quality standards. Standard sizes are listed, popular sizes are usually stocked, call and check 01256 768178. 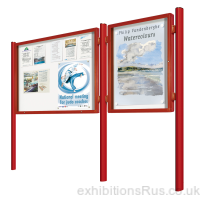 Our range of external notice boards are available in a smart satin anodised finish and also a range of colour paint finishes. A custom build service is also available, please call for details and quotation, expect a supply time of 4 weeks for this service. Optional interior lights available.